Background: While cheek implants are well known and done, how they actually work is often not appreciated. By being placed through an intraoral subperiosteal approach (most common insertion technique used) it is necessary to release the zygomatic ligaments and overlying soft tissues over and around he cheekbones. Once the implant is placed it acts like a spacer, lifting and keeping the soft tissues away from the bone surface. It is through this effect that a form of midface lift is obtained. The relevance of this on the back end is that if the cheek implants are removed, soft tissue support will be lost. But the cheek soft tissues are not likely to return to their original position as the ligamentous attachments have been permanently disrupted. 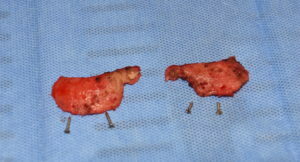 This is why when cheek implants are removed there will be a resultant soft tissue sag as the tissues now slide off of the bone to settle into a lower position. The concept of some form of a soft tissue lift with cheek implant removal is an often discussed topic. It is a concept challenged by how to do it both effectively and with a minimum of scarring. This is why lifts such as a combined intraoral-temporal technique is frequently used even though its vector of pull is not ideal. (45 degree oblique vs a more ideal completely vertical vector) A vertical lift option is the direct cheeklift through the lower eyelid. Case Study: This young male had Medpor cheek implantsshe wished to be removed and wanted to avoid a resultant soft tissue sag and deepening of the nasolabial folds.. Under general anesthesia and through an intraoral approach the Medpor cheek implants were unscrewed, freed of extensive soft tissue attachments and removed. 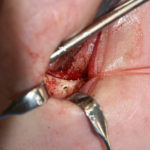 Then through a subciliary lower eyelid incision the cheek soft tissue elevation was completed and suspended with sutures to the bone holes placed along the infraorbital lateral orbital rim. This was combined with orbiculares resuspension and lateral canthopexies for additional support. The direct orbital rim suspension technique for cheek lifts has a powerful effect as it provides the ideal vertical vector. This directly counteracts the loss of cheek ligamentous attachments in direct opposition to how they were lost. Cheeklifts that have a temporal vector pull the cheeks in an oblique direction that can cause an unnatural cheek and lower eyelid appearance. A superior suspension is the more natural and effective vector. This will cause a temporal bunching of tissues around the eyelids but this always relaxed with healing and such overcorrection is needed to decrease the risk of lower eyelid ectropion. 1) Cheek implants create their effect by a suboeriosteal ligamentous release and an implant spacer lift effect. 2) When cheek implants are removed the loss of ligamentous attachments results in a soft tissue sag. 3) One option to prevent soft tissue sag with cheek implant removal is a direct orbital rim cheek suspension.